Top 40 List: A good time to shut ‘er down? 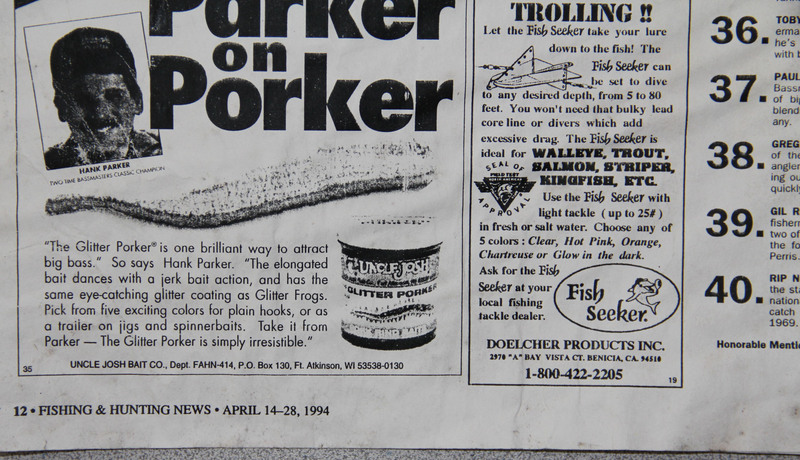 And the issue date (in Fishing & Hunting News) was April 14-18, 1994. That’s right, 20 years ago. If I get one published this year, it will be the 20th edition. Doesn’t that sound like a nice round number to end on? It gets harder every year to figure it out. It was hard enough when the first two editions were only the Southern California Top 40. 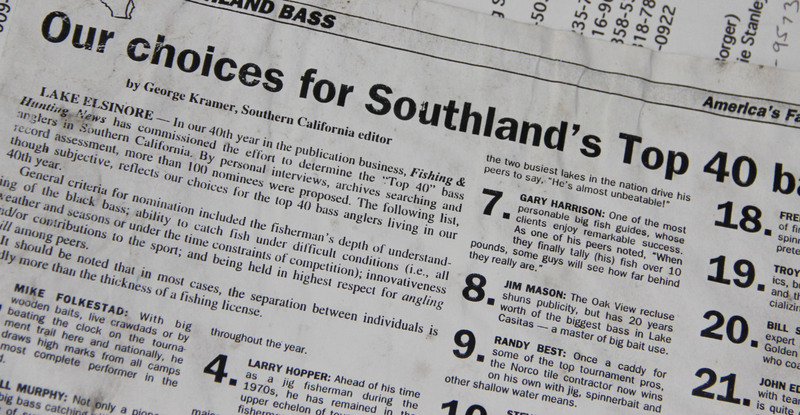 Once “the List” stirred up some interest around the launch ramp, I included the huge cadre of anglers from Northern California to the pool candidates, and the “little idea” for the paper turned into a 10-pound split shot. But it’s way tougher now. It’s not that more guys are catching fish, but more guys are telling everyone they are catching them. Facebook, Instagram and Go-Pro have turned a pool of 200 into maybe a thousand. So it’s kind of like being the teacher in a first grade class and holding up a picture of George Washington–and everybody’s hand goes up! That’s what it’s like with the Facebook pros. They’re all posting, but which ones came from a golf course, after hours, on a legal bait or from a private lake? Or actually from the lake they said it came? 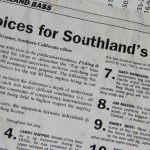 The List is supposed to be about ethical anglers, but sometimes “ethical” is not so easy to discern. Maybe we add some new rules. One I have been looking closely are catches made from waters not open to the general public. You may not be aware that decades back when Field & Stream Magazine was primary record keeper, it included many catch locations identified only as “private pond,” a county or city and the state. 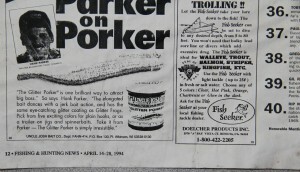 However, when those records were ceded over to the International Game Fish Association, within a very short period of time, all “private water” records disappeared. Some may have merely been exceeded, but I think the real issue was the new record-keeper saw a potential problem of verification. Another thing. Tournament field size seems like a legitimate concern. Just as they do with sponsor contingency money like Ranger Cup or one of those, you just can’t beat your four grandchildren and their mothers at MacArthur Park and figure it’s the same as an FLW Tour win when it comes to sponsor payouts. Not sure how we’ll do it just yet. (You probably have some ideas). We consider live bait, guides, tournament guys and big bass hunters–all traditional, ethical routes. But when it comes to naming the 40 best, I ‘d really like to think that’s what we are doing. This entry was posted on Monday, May 19th, 2014 at 4:02 pm	and is filed under News. You can follow any responses to this entry through the RSS 2.0 feed. You can skip to the end and leave a response. Pinging is currently not allowed. maybe george you should go back and show on your site the names starting back in 1994 and lets see where are they now? How about a 20 year top 40? If you’re wrapping this up George – why not do an all-time western top 40? Maybe a little less “scientific” about it and a lot more subjective – but it would be interesting to see who you would put on a list like that – one for the road, so to speak. Truth be told, I’m less sure about “all-time” than ever before. Not only do times change, but my perception about what is most worthy of such a list has changed as well. I know every era has its greatness, the bar is always being raised. I think there are enough Halls and monuments to recognize the best. I personally enjoy the “list”, it has always been a goal to make the list! Had to take a break from tournament fishing but firing back up next season and making the list was at the top of my list. I will be sad to see it go, maybe just a top 40 tournament list? Easy to research and decide? It’s all about the entertainment! Keep doing it and don’t worry about it. Those that matter don’t mind and those that mind don’t matter. Things are a lot more grey than they used to be George. So many people look forward to the release of the top 40 list each year! I really hope you don’t retire the list, it’s always a good and interesting read.